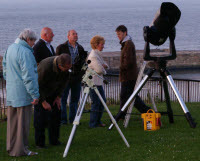 The ‘summer‘ star party season is almost upon us and as per other years we shall be hosting events from the Captain Cook headland area – West Cliff and some from the Archery Green area later in the summer. The dates listed below are for May and June scheduled events, (weather permitting). If the proceeding evening looks a better bet when we get to these dates, that may then become the observing night. If you can join us, (especially if you can bring a telescope along) it would be most appreciated. Hope to see you.